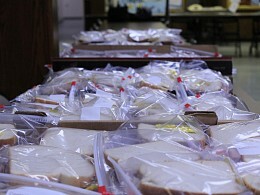 Today our St. Lawrence Project met after Vespers and assembled over 300 ham & cheese sandwiches. These sandwiches will be delivered to the St. Herman House of Hospitality and will feed the poor and needy in the city of Cleveland. After the sandwiches were made, those gathered enjoyed pizza and fellowship. Today, parishioners of St. Michael's gathered to Prosphora making. 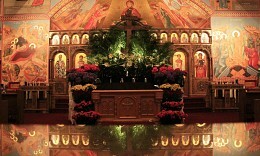 Our team meets about once every two months to make Prosphora for the Divine Liturgy. After the Prosphora is made, we make pizza. We hope to see you next time. Today our Samaritans Group celebrated 30+ years as a church Organization. The group focuses on making blankets, quilts and other items that are then donated to different charities. Tonight, our Jr. 'R' Club hosted their annual reverse raffle. 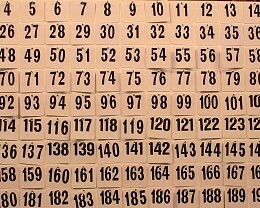 Over 125 guests attended and hoped that their number would be the last one called. Proceeds went to benefit the Jr. 'R' club's trip to the National Convention in New Jersey. Today, St. Michael's held our Annual Leadership Retreat as Woodside. The retreat was lead by Joe Kormos, Parish Development Ministry Leader of the Diocese of the Midwest. 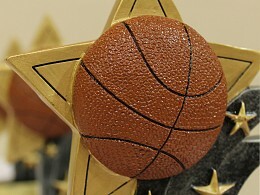 On Saturday March 24th, St Michael's hosted the 2012 FOCA Ohio District Basketball Tournament. Teams from all over Ohio gathered for friendly competition and fellowship. 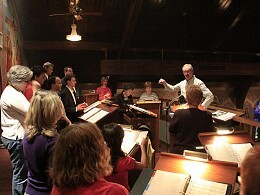 After the final game, vespers was held in church. The day was capped off by a Mexican food buffet and awards ceremony. On Sunday March 25th, our parish held its annual Lenten Retreat. This year's guest speakers were own very own parishioners, Drs. 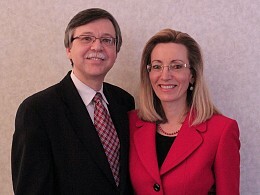 John and Judy Blebea. This year's retreat was a slideshow and presentation recounting the Blebea's recent pilgrimage to the Holy Land. 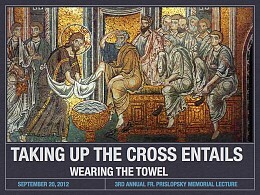 Their slideshow and first-hand accounts led all who attended in the footsteps of Christ. 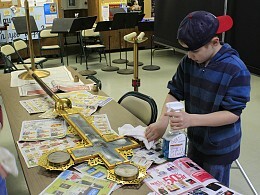 On Lazarus Saturday, our parish youth gathered for the Divine Liturgy and then a cleaning party. This year's first confession class culminated on Lazarus Saturday, when each of the students made their first confessions. This weekend, parishioners of St Michael's and members of the FOCA participated in the 2012 National Basketball Tournament weekend in South River, NJ. The weekend of basketball was capped off by a hierarchical liturgy served by His Grace, Bishop Michael. 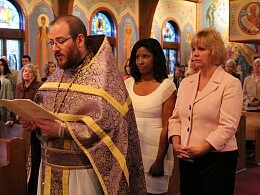 Scenes from Mother's Day Divine Liturgy, and St. Michael's Annual Mother's Day Banquet at Woodside Party Center. Today, St Michael's 55+ Club held their Annual Spring Luncheon. 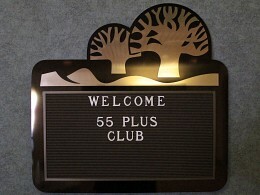 The event welcomed all members of the 55+ Club to come to Woodside Party Center for a wonderful afternoon of food and fellowship. 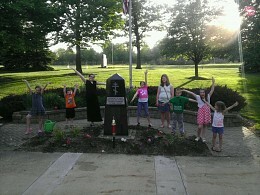 This evening following Great Vespers and the St. Lawrence Project, several of our parish youth helped plant flowers surrounding our church's Veteran's Memorial Monument. Thank you to Mr Steve Kovalak for organizing this service project! Tonight our parish hosted a BBQ cook-out for all of our volunteer bingo workers. BBQ Ribs, chicken wings, eggrolls, potato salad and more were enjoyed by all. We appreciate all of your hard work! 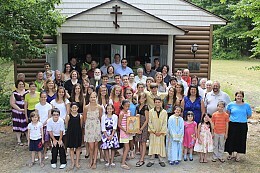 On Father's Day, St. Michael's held its annual picnic at the Shanty in honor of all fathers of the parish, as well all of the Sunday School, High School and college graduates. His Grace, Bishop Matthias, of Chicago and the Midwest visited St. Michael's this weekend. His Grace was present for Great Vespers on Saturday night, and again on Sunday morning when he celebrated the Hierarchical Divine Liturgy. Over 60 people from surrounding parishes traveled to celebrate the Divine Liturgy on the Patronal Feast Day of St. Vladimir's Summer Camp. Fr John Memorich and Dn. 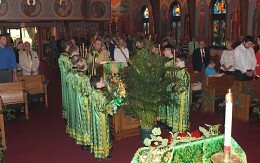 Daniel Kovalak served the Liturgy. Afterwards, Dr. John Schultz - president of the FOCA - presented a hand written icon of St Vladimir (patron of camp) and St Andrew (patron of the FOCA) to the camp to commemorate the feast. After the Liturgy, the newly-renovated chapel was blessed, and a cookout was enjoyed by all present. Today our parishioners showed up in large numbers to help make prosphora. This was an especially well attended day due to the fact that many of our parish youth, who are still out of school for the summer - were present. St Lawrence Project Turns 1-Year Old! Today the St Lawrence Project met to make sandwiches for the St. Herman House of Hospitality. This meeting marks the groups 1-year anniversary, and many parishioners turned out to lend a hand. Thank you to all who donate time and materials for this service project. May God reward your generosity. Today, our parish held its annual golf outing. About 50 parishioners participated in this year's tournament. Thank God, the weather was beautiful and everyone had a great time. Today, St. Michael's 55+ club gathered at the Shanty for their annual picnic luncheon. 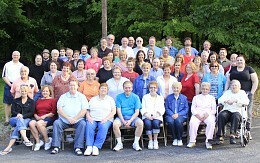 Tonight, our volunteer bingo workers gathered at The Shanty for an appreciation dinner. These events are always fun and show our volunteers just how much their efforts are appreciated. 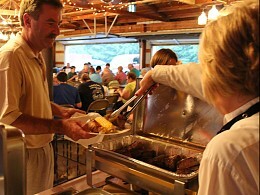 All were treated to an appetizer bar, drinks, a steak dinner with baked potato and corn on the cob. And at the end of the night, door prizes were awarded to a lucky few. Tonight, St Michael's parish held its third annual Fr. Prislopsky Memorial Dinner Lecture. Fr John Memorich gave a wonderful presentation entitled: Taking Up the Cross Entails Wearing the Towel: A Lecture on Christian Servitude, in which he talked about the need and duty for Christians to serve others. Before the talk, those present partook of an authentic Bible-era meal consisting of lamb and lentil stew, hummus, goat cheese, olives, dates, almonds, pita bread and more. It was a great meal and an edifying presentation. Today, St. Michael's hosted a local high school class studying different religions in America. The students and their teachers toured the church and had a Question & Answer session with Fr John. St. Michael's beautiful iconography attracts several high school and college classes each semester. Tonight, our St. Lawrence Project volunteers met at Cleveland's St. Herman's House of Hospitality for vespers, and to serve dinner to the area needy. St Herman's House of Hospitality is one of Cleveland's most shelters. Last year over 60,000 meals were served to area needy. 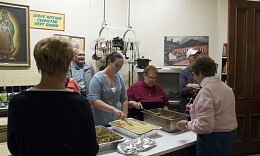 Tonight, our parishioners helped plate meals, pour drinks, and wash dishes. Everyone had a great time and are already looking forward to our next trip. We hope you will join us next time. This morning, St Michael's kicked off the Sunday School year with a moleben asking God's blessings upon all of the students, their teachers and parents. Afterwards, the students went downstairs to begin their courses. 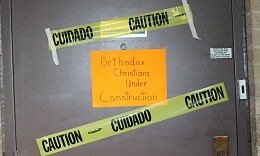 The theme of this year's Sunday School is Orthodox Christians Under Construction. 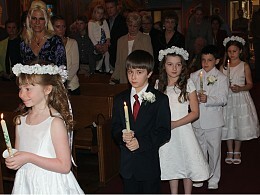 During the Liturgy, the students held candles at the Gospel reading. 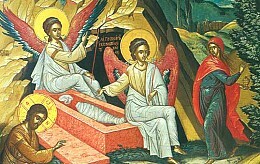 The feast of the Nativity of our Lord and God and Savior Jesus Christ. Click here to see photos from the Divine Liturgy and the Christmas Social that followed. Christ is Born! Glorify Him! Today Fr John eplained the service of Proskemidia to our 7th, 8th and 9th grade Sunday School class. 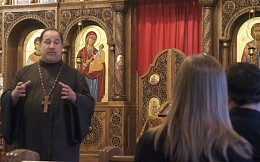 The class has been discussing the Divine LIturgy, and observation of this service proved to be very educational. Today about 40 parishioners gathered at the church to help decorate and set up the Youth Christmas Tree in the narthex. 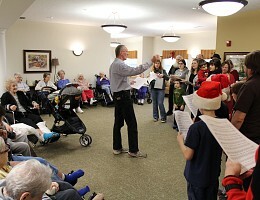 Afterwards, we headed out to several different nursing homes to sing Christmas carols for the residents. This year we had the most carollers ever. We hope to beat this number next year! Today on the feast of St. Herman of Alaska, some of the faithful from St. Michael's and others from area churches gathered at St. Herman's House of Hospitality to celebrate the Divine Liturgy for the house's patron saint. 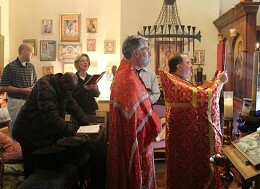 Fr John Memorich and Fr Michael Butler (St. Innocent Orthodox Church, Olmstead Falls, OH) concelebrated the Liturgy. Also in attendance were members of the St Hermans House of Hospitality Board. 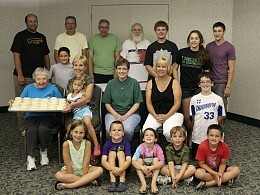 Today our Samaritans group gathered and boxed cookies for parishioners who are home-bound or in nursing homes. 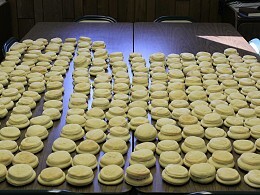 The Christmas cookies were baked by members of our parish, and will be delivered over the next week. Afterwards lunch was enjoyed by all. 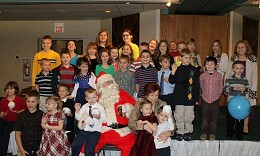 Today our parish held its annual Sunday School Christmas Yolka. Students from our Sunday School program performed skits and songs for all present. Afterwards, the children were surprised with a visit from St. Nicholas! This weekend, St. Michael's was honored to host a special exhibit from St. Tikhon's Monastery Museum. This is the first time ever that icons, vestments and relecs have left the museum repository and ventured out for the faithful of North America to see and venerate. In conjunction with the items from the museum, the Seminary Mission Choir also gave a concert to raise money for St. Tikhon's Seminary. Tonight, we had a double event at St Michael's. After Vespers, our St. Lawrence Project gathered downstairs and prepared soup for 90 to be served at St Herman's House of Hospitality. Afterwards, we held our Advent Family Movie Night. Each Saturday night after vespers during Advent, we host a Family Movie Night, where we watch a family Christmas movie and have a pizza party. Hope to see you at next week's Advent Family Movie Night! Today our parish celebrated the feast of our heavenly patron The Holy Archangel Michael. After the festal Divine Liturgy over 200 parishioners gathered at Woodside Party Center for our annual St. Michael's Day Banquet. On this occation of the parish's 90th anniversary, guests were treated to live music, drinks, a roast beef lunch and a presentation on the history of St Michael's parish. Tonight, we had our annual Pig Roast down at the Shanty. 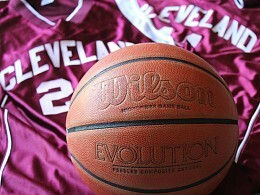 The Pig Roast is sponsored by the Cleveland 'R' Club Chapters 4 & 6. All present partook of delicious roast pork,hamburgers, hot dogs and ll the fixings. All proceeds from the event went to fund the renovation project of St. Vladimir's Chapel out at our St. Vladimir Summer Camp & Retreat Center. 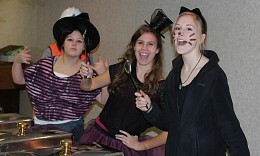 Today, our Jr 'R' Club hosted its Annual Halloween Brunch. 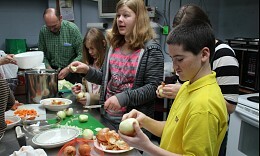 Over one hundred parishioners attented and enjoyed a delicious brunch served by some of our parish youth. Proceeds go to support the Christmas Stocking Project, with sends needed gifts and supplies to orphanages in Eastern Europe. Tonight our St. Lawrence Project group met after vespers to make candied apples. 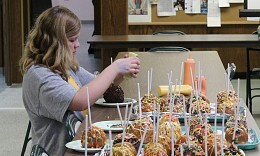 The apples were decorated by all present and will be sold after the Divine Liturgy tomorrow. Proceeds will go towards shipping icon prints to an Orthodox community in Africa. These icons will be the first icons many of the local Orthodox people ever own, and have prayers printed on them in their native language. 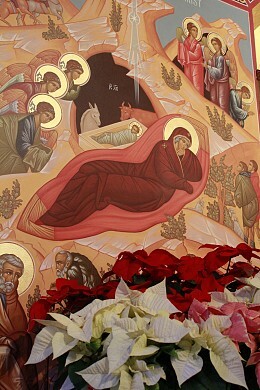 Today, our parish was blessed with the visitation of the miraculous myyrh-streaming Iveron icon of the Mother of God. Over 150 faithful from all Christian backgrounds - Orthodox, Roman Catholic, and Protestants - gathered to greet the icon when she arrived and stayed for the Akathis and Moleben served before her holy image. After the service, all came forward to venerate the icon, offer prayers, and to be announted with the holy and fragrant myrrh with flows from the icon. 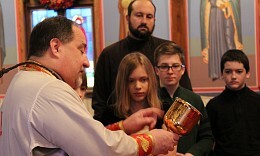 Today, many of our parishioners joined forces to help pinch pirogis. The pirogis will be sold at the upcoming craft sale and proceeds will benefit St Michaels Parish. After Liturgy today, members of our Jr. R Club made crafts. The crafts will be sold at the upcoming Craft Sale at Woodside. Proceeds will benefit Jr R Club activities and outings. On Saturday, October 13th, Mikey Gaydos, Samantha Ramsey, and Nicole Gaydos took the hoagies that they made earlier that day at Strongsville High School over to St Herman’s House of Hospitality and served lunch to the area needy. Thanks to the generosity of St Michael’s parishioners, they were able to provide over 90 foot-long hoagies, and also 24 doz Krispy Kreme donuts donated by the High School. As can be seen from the photos, and as is typical, there is great joy involved in helping others. 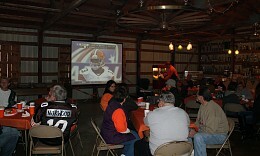 Today following the Divine Liturgy, the Cleveland 'R' Club hosted the 3rd Annual Brown's Tailgate Party down at the Shanty. Everyone enjoyed grilled hamburgers, hotdogs, buffalo wings, and all the fixings while watching the Cleveland Brown's take on the NY Giants. It was a great afternoon of fun, fellowship and football. Following the Divine Liturgy, all of the Sunday School students, teachers and families gathered at The Shanty for our annual Sunday School Picnic. Pizza, sandwiches, chips and soda were enjoyed by all. Afterwards the kids played basketball, football and hung out while the parents enjoyed a nice afternoon of fellowship.